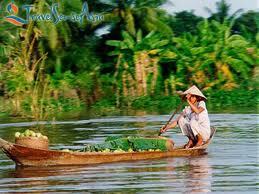 Meet your guide at your place, transfer to Ben Tre where we take a boat trip on the Mekong River to Coconut Islet. Enjoy a brief walk on the islet, trying native fruits and viewing local handicraft production. Continue by boat to Tan Thach Commune to visit a family-run enterprise making coconut candy. Take a horse-drawn cart to Quoi Son to visit a bee farm and to enjoy tea & candies. After lunch with sample the local delicacy, Elephant\’s Ear Fish. Return by boat to My Tho, where our vehicle is waiting for transfer to Can Tho for overnight. After breakfast, take a boat ride to Bay Canh islet, snorkelling and admire colourful coral. Picnic on Islet. Then enjoy a trek through the magical, time-forgotten mangrove forests characteristic of Southern Vietnam, and discover beautiful coral reefs by snorkelling at low tide. Swimming and snorkelling at Bay Canh Beach. Back to your hotel. Overnight in Con Dao. Free for your own leisure. Overnight in Con Dao.